PRESQUE ISLE, Maine — Paul Cyr’s new book, “NORTHERN MAINE with Paul Cyr,” goes on sale today. The 128-page, hardcover book contains 450 of Cyr’s photographs and sells for $29.95. “NORTHERN MAINE with Paul Cyr” represents a small sampling of some of the best moments Cyr has captured over the past 15 years while visiting the people, places, and things he enjoys the most. Cyr shares his work with over 30,000 followers on Facebook at Paul Cyr Photography. 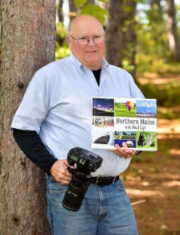 His inventory of photographs is measured in the thousands and many are used by dozens of northern Maine towns and businesses for websites, report covers, and tourist guides. Designed by local graphic designer Theresa Mosher, Cyr’s book sells online at www.moshermultimedia.com. “NORTHERN MAINE with Paul Cyr” is also sold at the following locations in Presque Isle, Bradley’s Citgo, Country Collectables, Goin’ Postal, Morning Star Art & Framing, and at the Aroostook Centre Mall’s Information desk; Brambleberry Market and County Quick Stop in Caribou; Mars Hill Pharmacy, Mars Hill; DOC’s Place, Houlton; Mike’s Family Market, Limestone; Hebert Rexall Pharmacy, Van Buren; Robert’s Jewelry, Madawaska; John’s Shurfine, Fort Kent; Forget Me Not Shoppe, East Millinocket; and, Dysart’s Restaurant & Truck Stop on Coldbrook Road, Hermon. MORE ABOUT PAUL CYR’S WORK: People may also find Cyr’s photographs featured prominently in the local media and Bangor Daily News, as well as Barcroft Media (London), Mirror (London), Boston Globe, Yankee and DownEast magazines, and more. Cyr’s work has been featured twice on WCSH News Center’s Bill Green’s Maine show. Down East Books recently published two books exclusively featuring Cyr’s photographs: Uses for Mooses (2017) and Bears Behaving Badly (2016), and included Cyr’s photographs in Maine Life in a Day (2017). In 2014, Cyr and local author Dottie Hutchins published ACADIAN ROOTS: Images of the St. John Valley to commemorate the World Acadian Congress. All can be found at www.amazon.com.